“The effect of gasoline consumption tax on consumption and carbon emissions during a period of low oil prices,” (with L. Zhao, L. He, L. Chen, and G. Zeng), https://doi.org/10.1016/j.jclepro.2017.10.117, Journal of Cleaner Production, 171 (2018) 1429-1436. “Environmental efficiency and abatement efficiency measurements of China’s thermal power industry: A DEA based materials balance approach,” (with K. Wang and Y. Wei), http://dx.doi.org/10.1016/j.ejor.2017.04.053, European Journal of Operational Research. “On selecting directions for directional distance functions in a non-parametric framework: A review”, (with K. Wang, Y. Xian, C. Li, and Y. Wei), http://link.springer.com/article/10.1007/s10479-017-2423-5, Annals of Operations Research, February 2017, pp. 1-34. “Energy Economics and Climate Policy Modeling”, (with Y. Wei, K. Wang, and H. Liao), DOI 10.1007/s10479-017-2564-6, Annals of Operations Research, 255 (2017), pp.1-7. “Measuring energy economic efficiency: A mathematical programming approach,” (with Y. Wei, Y. Du, H. Liao), forthcoming, Applied Energy. “Coordination and performance analysis for a three-echelon supply chain with a revenue-sharing contract,” (with Y. Hou, F. Wei, S. X. Li, and A. Ashley), http://dx.doi.org/10.1080/00207543.2016.1201601, International Journal of Production Research, 55 (2017), pp. 202-227. “Sources of carbon productivity change: A decomposition and disaggregation analysis based on global Luenberger productivity indicator and endogenous directional distance function,” (with K. Wang, Y. Xian, and Y.M. Wei), Ecological Indicators, 66 (2016), 545-555. “Potential gains from carbon emissions trading in China: A DEA based estimation on abatement cost savings” (with K. Wang and Y.M. Wei), Omega: The International Journal of Management Science. 63 (2016), 48-59. “Pre-Purchasing with Option Contract and Coordination in A Relief Supply Chain,” (with X. Wang, L. Liang, and A. Ashley), International Journal of Production Economics, 167 (2015), 170-176. “Climate Policy Modeling: An Online SCI-E and SSCI Based Literature Review,” (with Y. Wei and Z. Mi), Omega: The International Journal of Management Science. 57 (2015), 70-84. “SMAA-AD Model in Multicriteria Decision-making Problems with Stochastic Values and Uncertain Weights,” (with F. Yang, F. Zhao and L. Liang), The inauguration issue of the Annals of Data Science. 1 (2014), 95-108. “Horizontal cooperative programs and cooperative advertising,” (with Q. Gou, J. Zhang, L. Liang, and A. Ashley), International Journal of Production Research, 52 (2014) 3, 691-712. "Game Theory Approach and Contract to Price and Advertisement Decisions in A Manufacturer-Retailer Supply Chain", (with J. Yue, J. Austin, and B. Chen). European Journal of Operational Research, 231 (2013) 2, 492-502. "Supply chain coordination through cooperative advertising with reference price effect", (with J. Zhang, Q. Gou, and L. Liang), OMEGA, The International Journal of Management Science, 41 (2013), 345-353. "Manipulation and Equilibrium around Seasoned Equity Offerings", (with Y. Han, X. Cui, and A. Ashley) International Journal of Information Technology and Decision Making, 10 (2011), 771-792. "Assessment Methods in Social Systems Science", (with L. Liang, and S. Wang), International Journal of Society Systems Science, 3 (2011), 1-3. "Assessment and Sustainable Society", (L. Liang and S. Wang), International Journal of Sustainable Society, 3 (2011), 221-224. "The Performance Evaluation of Regional R&D Investments in China: An Application of DEA Based on the First Official China Economic Census Data", (with W. Zhong, W. Yuan, and S. X. Li), OMEGA, The International Journal of Management Science, 39 (2011), 447-455. "Coordination of Supply Chains by Option Contracts: A Cooperative Game Theory Approach", (Y. Zhao, S. Wang, T. Cheng, and X. Yang), European Journal of Operational Research, 207 (2010), 668-675. "An Inventory Approach for a Local Collection Point in Reverse Supply Chains", (with Q. Gou, L. Ren, L. Liang), International Journal of Sustainable Society, 1 (2008), 55-84. W. W. Cooper, Z. Huang, S. Li, and J. Zhu (2008), CRITIQUES OF DMITRUK AND KOSHEVOY AND OF BOL PLUS EXPANDED OPPORTUNITIES FOR EFFICIENCY AND EFFECTIVENESS EVALUATIONS WITH DEA. Journal of Productivity Analysis, 29, 15-21. "A Joint Inventory Model for An Open-Loop Reverse Supply Chain", (with Q. Gou, L. Liang, and C. Xu), International Journal of Production Economics, 116 (2008), 28-42. "Incentives for Information Sharing in Duopoly with Capacity Constraints", (with J. Wu and X. Zhai)Omega: The International Journal of Management Science, 36 (2008), 963-975. "Efficiency Aggregation with enhanced Russell Measures in Data Envelopment Analysis", (W. W. Cooper, Z. M. Huang, S. X. Li, B. R. Parker, and J. T. Pastorwith W. W. Cooper, S. X. Li, B. R. Parker, and J. T. Pastor), Socio-Economic Planning Sciences, 41 (2007), 1-21. Z. M. Huang, W. Cheung and H. Wang (2006), Cone Dominance and Efficiency in DEA. Annals of Operations Research, 145, 89-103. S. X. Li, Z. M. Huang, and A. Ashley (2006), Vertical Cooperative Advertising in a Manufacturing Retailer Supply Channel. Applications of Management Science: In Productivity, Finance, and Operations, 12, 157-174. J. Yue, J. Austin, M. Wang, Z. Huang (2006), Coordination of Cooperative Advertising in a Two-Level Supply Chain when Manufacturer Offers Discount. European Journal of Operational Research, 168, 65-85. D. Wu, L. Liang, Z. M. Huang, and S. X. Li (2005), Aggregated Ratio Analysis in DEA. International Journal of Information Technology & Decision Making, 4, 369-384. Z. M. Huang, S. X. Li, and J. Zhu (2005), A Special Issue on "Data Envelopment Analysis: Theories and Applications" in Honor of William W. Cooper. International Journal of Information Technology & Decision Making, 4, 311-316. S. X. Li, Z. M. Huang, Z. Mao, and A. Ashley (2004), An application of game theory and multiple objective programming in supply chains through franchising. Applications of Management Science, 11, 177-208. W. W. Cooper, H. Deng, Z. M. Huang, and S. X. Li (2004), A Chance Constrained Programming Approach to Congestion in Stochastic Data Envelopment Analysis. European Journal of Operational Research, 155, 487-501. J. Yue, M. Wang, and Z. M. Huang (2004), Commit Time Design for Measuring Demand Side Quality Costs with Limited Distribution Information. International Journal of Information Technology and Decision Making, 3, 453-470. S. X. Li, Z. M. Huang, J. Zhu, and P. Chau (2002), Co-op Advertising, Game Theory, and Supply Chain Management. Omega: The International Journal of Management Science, 30, 347-357. S. X. Li, Z. M. Huang, and A. Ashley (2002), Manufacturer and Retailer Cooperation Through Franchising: A Chance Constrained Game Approach. Information Systems and Operational Research, 40, 131-148. Z. M. Huang, S. X. Li, and V. Mahajan (2002), An Analysis of Manufacturer-Retailer Supply Chain Coordination in Cooperative Advertising. Decision Sciences, 33, 469-494. W. W. Cooper, H. Deng, Z. M. Huang, and S. X. Li (2002), A One-Model Approach to Congestion in Data Envelopment Analysis. Socio-Economic Planning Sciences, 36, 231-238. W. W. Cooper, H. Deng, Z. M. Huang, and S. X. Li (2002), Chance Constrained Programming Approaches to Technical Efficiencies and Inefficiencies in Stochastic Data Envelopment Analysis. Journal of the Operational Research Society, 53, 1347-1356. Z. M. Huang and S. X. Li (2001), Co-Op Advertising Models in A Manufacturing-Retailing Supply Chain: A Game Theory Approach. European Journal of Operational Research, 135, 81-98. Z. M. Huang and S. X. Li (2001), Stochastic DEA Models with Different Types of Input-Output Disturbances. Journal of Productivity Analysis, 15, 95-113. Z. M. Huang (2000), Franchising Cooperation Through Chance Cross-Constrained Games. Naval Research Logistics, 47, 669-685. W. W. Cooper, V. Lelas, S. X. Li, and O. B. Olesen (1998), Chance Constrained Programming Formulations for Stochastic Characterizations of Efficiency and Dominance in DEA. Journal of Productivity Analysis, 9, 53-79. Z. M. Huang, S. X. Li and J. J. Rousseau (1997), Determining Rate of Change in Data Envelopment Analysis. Journal of the Operational Research Society, 48, 591-599. P. L. Brockett, A. Charnes, W. W. Cooper, Z. M. Huang, and D. B. Sun (1997), Data Transformations in DEA Cone-Ratio Envelopment Approaches for Monitoring Bank Performances. European Journal of Operational Research, 98, 250-268. Z. M. Huang (1997), Bargaining, Risk, and Franchising Coordination. Computers and Operations Research, 24, 73-83. S. X. Li, Z. M. Huang, and A. Ashley (1996), Inventory, Channel Coordination and Bargaining In A Manufacturer-Retailer System. The Annals of Operations Research, 68, 47-60. W. W. Cooper, Z. M. Huang, and S. X. Li (1996), Satisficing DEA Models under Chance Constraints. The Annals of Operations Research, 66, 279-295. Z. M. Huang (1996), A Game Theoretical Approach to Franchising Arrangement. International Journal of Systems Science, 27, 611-622. S. X. Li, Z. M. Huang, and A. Ashley (1996), Improving Buyer-Seller System Cooperation Through Inventory Control. International Journal of Production Economics, 43, 37-46. Z. M. Huang and S. X. Li (1996), Dominance Stochastic Models in Data Envelopment Analysis. European Journal of Operational Research, 95, 390-403. W. W. Cooper, H. Hemphill, Z. M. Huang, S. X. Li, V. Lelas, and D. Sullivan (1996), Survey of Mathematical Programming Models in Air Pollution Management. European Journal of Operational Research, 96, 1-35. S. X. Li and Z. M. Huang (1996), Determination of The Portfolio Selection for A Property-Liability Insurance Company. European Journal of Operational Research, 88, 257-268. Z. M. Huang, S. X. Li, and Q. L. Wei (1996), Quasi-Concave Multiple Objective Programming With Cone Structure. Systems Science and Mathematical Sciences, 9, 27-37. Z. M. Huang, S. X. Li, V. Raghavan, and D. B. Sun (1995), Proper Efficiency and Cardinal Utilities in Multicriteria Decision Making. European Journal of Operational Research, 82, 476-489. S. X. Li, Z. M. Huang, and A. Ashley (1995), Seller-Buyer System Co-Operation in a Monopolistic Market. Journal of the Operational Research Society, 46, 1456-1470. Z. M. Huang and S. X. Li (1995), Managing Buyer-Seller System Cooperation with Quantity Discount Considerations. Computers and Operations Research, 22, 947-958. A. Charnes, Z. M. Huang, and V. Mahajan (1995), Franchising Coordination with Brand Name Consideration. Research in Marketing, 12, 1-47. W. C. Chiang, J. Fitzsimmons, Z. M. Huang, and S. X. Li (1994), A Game-Theoretic Approach to Quantity Discount Problems. Decision Sciences, 25, 153-168. Z. M. Huang and S. X. Li (1994), The Role of Cardinal Utilities in Multiple Objective Programming. American Journal of Mathematical and Management Sciences, 14, 301-325. A. Charnes, Z. M. Huang, J. J. Rousseau, and R. Armstrong (1993), Vector Extremal Systems in Cross-constrained Games of Regulatory Policy Analysis and Synthesis. Journal of Economic Behavior and Organization, 21, 333-347. A. Charnes, W. W. Cooper, Z. M. Huang, and D. B. Sun (1991), Relations Between Half-Space Finitely Generated Cones in Polyhedral Cone-Ratio DEA Models. International Journal of Systems Science, 22, 2057-2077. P. Brockett, Z. M. Huang, H. Li and D. Thomas (1991), Information Theoretic Multivariate Graduation. Scandinavian Actuarial Journal, 2, 144-153. A. Charnes, W. W. Cooper, Z. M. Huang, and D. B. Sun (1990), Polyhedral Cone-Ratio DEA Models with an Illustrative Application to Large Commercial Banks. Journal of Econometrics, 46, 73-91. A. Charnes, W. W. Cooper, Q. L. Wei, and Z. M. Huang (1990), Fundamental Theorems of Nondominated Solutions Associated with Cones in Normed Linear Spaces. Journal of Mathematical Analysis and Applications, 150, 54-78. A. Charnes, Z. M. Huang, J. Semple, D. Thomas, and T. Song (1990), Origins and New Directions in Data Envelopment Analysis. Arabian Journal for Science and Engineering, 15, 617-625. A. Charnes, Z. M. Huang, J. J. Rousseau, and Q. L. Wei (1990), Cone Extremal Solutions of Multi-Payoff Games with Cross-Constrained Strategy Sets. Optimization, 21, 51-69. A. Charnes, W. W. Cooper, Q. L. Wei, and Z. M. Huang (1989), Cone Ratio Data Envelopment Analysis and Multi-Objective Programming. International Journal of Systems Science, 20, 1099-1118. Z. M. Huang (1985), The Second Order Conditions of Nondominated Solutions for Generalized Multiobjective Mathematical Programming. Journal of System and Mathematics Science, 5, 172-184. Z. M. Huang (1983), A Note about the Proof of Farkas Theorem. Journal of Aeronautics and Astronautics, 4, 102-104. S. X. Li and Z. Huang (2012). Interactive Inventory Models in a Supply Chain System. In The INFORMS International Meeting. Beijing, China. J. Yue, J. Austin, Z. Huang, and B. Chen (2011). Coordination in Cooperative Advertising and Pricing in Manufacturer-Retailer Supply Chain when Both Parties Offer Discounts. In Annual Meeting of Decision Sciences Institute. Boston, Massachusetts. S. X. Li, Z. Huang, and J. Yue (2011). A Dynamic Model of Cooperative Advertising in a Manufacturer and Retailer Supply Chain. In The 11th International Conference of Decision Sciences Institute and The 16th Annual Conference of Asia-Pacific Decision Sciences Institute. Taipei, Taiwan. J. Yue, J. Austin, B. Chen and Z.M.Huang (2009). A Game Theory Approach to Price and Advertisement Decisions in a Manufacturer-Retailer Supply Chain. In Proceedings of the 40th Annual Meeting of Decision Sciences Institute. Orleans, Louisiana. S. X. Li and Z.M.Huang (2009). Game Theory and Inventory Management. In Proceedings of the Western Decision Sciences Institute Thirty-Eighth Annual Meeting. Kauai, Hawaii. S. X. Li and Z. M. Huang (2008). Game Theory Approach to Co-op Advertising in a Manufacturer-Retailer Supply Chain. In The XVIII ACME International Conference on Pacific Rim Management. Toronto, Canada. Q. Gou, L. Ren, L. Liang, and Z. M. Huang (2008). An Inventory Model for a Local Collection Point with Product Recovery and Resale. In The XVIII ACME International Conference on Pacific Rim Management. Toronto, Canada. S. X. Li and Z. M. Huang (2007). Proper Efficiency in Multicriteria Decision Making. In Fourth Annual Meeting of Applied Business and Entrepreneurship Association International. Maui, Hawaii. Z. M. Huang and S. X. Li (2007). Models in Cooperative Advertising of Manufacturer-Retailer Supply Chains. In Fourth Annual Meeting of Applied Business and Entrepreneurship Association International. Maui, Hawaii. S. X. Li and Z. M. Huang (2007). Strategic Analysis in Manufacturer-Retailer Co-op Supply Chains (Invited Keynote Speech). In First International Conference on Management Innovation. Shanghai, P. R. China. S. X. Li and Z. M. Huang (2006). Inventory Management and Negotiation Strategies in a Manufacturer-Retailer Chain. In Proceedings of the Thirty-Fifth Annual Meeting of Western Decision Sciences Institute (pp. 663-665). Waikoloa, Hawaii. Z. M. Huang and S. X. Li (2006). Co-Op Advertising Strategies in Manufacturer-Retailer Supply Chains. In Proceedings of the Thirty-Fifth Annual Meeting of Western Decision Sciences Institute (pp. 602). Waikoloa, Hawaii. Z. M. Huang and S. X. Li (2005). Power Shifting in Manufacturer-Retailer Supply Chains. In Proceedings of the 2005 International Applied Business Research Conference. Puerto Vallarta, Mexico. S. X. Li and Z. M. Huang (2005). Game Approach to Inventory Management. In Proceedings of the 2005 International Applied Business Research Conference. Puerto Vallarta, Mexico. J. Yue, J. Austin, M. C. Wang, and Z. M. Huang (2004). Coordination of Cooperative Advertising in a Two-Level Supply Chain When Manufacturer Offers Discount. In Proceedings of the 2004 Decision Sciences Institute Annual Meeting. Boston, Massachusetts. Z. M. Huang and S. X. Li (2004). Coordination and Cooperation in Manufacturer-Retailer Supply Chains. In Chinese Academy of Sciences Symposium on Data Mining and Knowledge Management. Beijing, China. Z. M. Huang and S. X. Li (2004). Supply Chain Coordination through Franchising: A Chance Constrained Game Approach. In 12th INFORMS/APS Conference. Beijing, China. S. X. Li and Z. M. Huang (2004). Vertical Cooperative Advertising in Manufacturer-Retailer Supply Chains. In 12th INFORMS/APS Conference. Beijing, China. Z. M. Huang, S. X. Li, and Z. Mao (2004). Inventory Management and Negotiation Strategies in a Manufacturer-Retailer Supply Chain. In Proceedings of the International Technology & Global Business Research Conference (pp. 28-33). Cancun, Mexico. S. X. Li and Z. M. Huang (2004). Co-Op Advertising and Game Theory in Manufacturer-Retailer Supply Chains. In Proceedings of the International Technology & Global Business Research Conference (pp. 122-124). Cancun, Mexico. Z. M. Huang and S. X. Li (2003). Franchising in Manufacturer-Retailer Supply Chains. In Proceedings of the 2003 ACME International Conference (pp. 632-637). Seattle, Washington. S. X. Li and Z. M. Huang (2003). Managing Inventories in Supply Chains. In Proceedings of the 2003 ACME International Conference (pp. 626-631). Seattle, Washington. S. X. Li, Z. M. Huang, and H. Li (2003). Franchising Coordination in Manufacturer-Retailer Supply Chains. In Proceedings of the 2003 European Applied Business Research Conference (pp. Article # 367). Venice, Italy. Z. M. Huang, S. X. Li, and H. Li (2003). Co-Op Advertising and Game Theory in Manufacturer-Retailer Supply Chains. In Proceedings of the 2003 European Applied Business Research Conference (pp. Article #366). Venice, Italy. Z. M. Huang, S. X. Li, and Z. Mao (2002). Franchising and Game Theory in Supply Chains. In Proceedings of the 2002 Decision Sciences Institute Annual Meeting (pp. 1463-1465). San Diego, California. S. X. Li and Z. M. Huang (2002). Game Theory Models for Cooperative Advertising in Manufacturer-Retailer Channels. In Proceedings of the 2002 Applied Mathematical Programming and Modelling (pp. 92-93). Varenna, Italy. Z. M. Huang and S. X. Li (2002). Model Franchising in Manufacturer-Retailer Supply Chains through Chance Constrained Game Theory. In Proceedings of the 2002 Applied Mathematical Programming and Modelling (pp. 94-95). Varenna, Italy. Z. M. Huang and S. X. Li (2002). Retailing Power Shifts in Manufacturer-Retailer Supply Chains. In Asian Forum on Business Education. Beijing, China. S. X. Li and Z. M. Huang (2002). Cooperative Advertising and Multi-Objective Programming in Supply Chains. In Fifth International Conference on Multi-Objective Programming and Goal Programming: Theory and Applications. Nara, Japan. Z. M. Huang and S. X. Li (2002). Stochastic DEA Models and Multi-Objective Programming. In Fifth International Conference on Multi-Objective Programming and Goal Programming: Theory and Applications. Nara, Japan. S. X. Li and Z. M .Huang (2001). Inventory Models and Game Theory in a Supply Chain System. In Proceedings of the 2001 Decision Sciences Institute Annual Meeting. San Francisco, California. Z. M .Huang and S. X. Li (2001). Chance Constrained Programming and Stochastic DEA Models. In Proceedings of the 2001 Decision Sciences Institute Annual Meeting (pp. 447-449). San Francisco, California. Z. M. Huang and S. X. Li (2001). Chance-Constrained DEA Models with Variable Returns-to-Scale. In INFORMS National Meeting. Miami Beach, Florida. 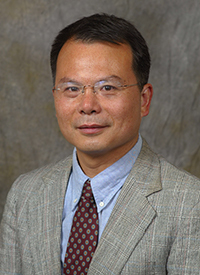 Z. M. Huang (2001). Chance cross-constrained game models of franchising arrangements. In Proceedings of the 6th International Conference of the Decision Sciences Institute. Chihuahua, Mexico. S. X. Li and Z. M. Huang (2001). Inventory, Channel Coordination and Bargaining in Manufacturer-Retailer Supply Chains. In INFORMS International Meeting. Hawaii. S. X. Li and Z. M. Huang (2000). Stochastic DEA Models with Different Types of Input-Output Analysis. In INFORMS-KORMS International Meeting. Seoul, Korea. Z. M. Huang and S. X. Li (2000). Proper Efficiency and Cardinal Utilities in Multicriteria Decision Making. In INFORMS National Meeting. Salt Lake City, Utah. S. X. Li and Z. M. Huang (2000). A Game Model in Inventory Supply Chain Systems. In INFORMS National Meeting. Salt Lake City, Utah. Li, S. X. and Z. M. Huang (1999). System Cooperation with Quantity Discount Consideration. In INFORMS National Meeting. Philadelphia, Pennsylvania. Huang, Z. M. and S. X. Li (1999). Cone Dominance Chance Constrained DEA Models. In INFORMS National Meeting. Philadelphia, Pennsylvania. Center for Cybernetic Studies, The University of Texas at Austin, Developing Cross Constrained Game Models to handle transportation problems and regulatory agency problems under National Science Foundation Grants and a U. S. Army Contract (1989-1993). Developing models on efficiency evaluations for large U.S. commercial banks under a National Science Foundation Grant and a U. S. Army Contract (1987-1991). The 2013-2014 Excellence in Faculty Scholarship and Creative Work Award, Adelphi University, 2014. Outstanding Author Contribution in the 2014 Emerald Literati Network Awards for Excellence. University Professor Recognition Award, Adelphi University, 2013. Outstanding Research Award for 2011-2012, Robert B. Willumstad School of Business, Adelphi University. Certificate of Merit, Robert B. Willumstad School of Business, Adelphi University, August 12, 2012. Distinguished Paper Award, the 40th Annual Meeting of Decision Sciences Institute (DSI), New Orleans, Louisiana, November 14-17, 2009. Member of Editorial Board, International Journal of Society Systems Science (IJSSs). American Editor, International Journal of Sustainable Society (IJSSoc). Member of Editorial Board, International Journal of Services Sciences (IJSSCI). Member of Editorial Board, International Journal of Information Technology and Decision Making (IT&DM). Guest Editor, special issue of International Journal of Information Technology and Decision Making on "Data Envelopment Analysis: Theories and Applications," in honor of William W. Cooper, 2005. Associate Editor, OMEGA-The International Journal of Management Science. Invited Co-Keynote Speaker at the First International Conference on Management Innovation, Shanghai, China, June 2007. Conference Organizing Committee Member of The 20th International Conference on Multiple Criteria Decision Making, Chengdu/Jiuzhaigou, China, June 21-26, 2009. Program Committee Member of the First International Conference on Management Innovation, Shanghai, June 2007.
International Committee Member of the Chinese Academy of Sciences Symposium on Data Mining and Knowledge Management, Beijing, China, July 2004. Invited Co-Keynote Speaker at the Asian Forum on Business Education, Beijing, China, June 2002. Chairman and Organizer of the New DEA Methods III Session (Invited Session) for the INFORMS Conference, Miami, Florida, November 2001. Chairman and Organizer of the New DEA Developments and Uses I Session (Invited Session) for the INFORMS International Meeting, Seoul, Korea, June 2000.
International Committee Member of The Fifth International Conference on Industrial Engineering and Management Science, Beijing, China, August 1998. Chairman of the Pricing, Attitude Relationships, Learning and Case Analyses in Marketing Session for the Decision Sciences Meeting, Orlando, November 1996. Chairman and Organizer of the Decision Analysis and Its Applications Session (Invited Session) for the IFORS International Meeting, Vancouver, Canada, July 1996. Chairman of the Advertising Strategies and Effects Session, Decision Science Meeting, Boston, November 1995. Chairman of the Measuring Productivity Process in Emerging Markets with DEA Session (Invited Session), INFORMS Conference, New Orleans, October 1995. Chairman of the New Developments in DEA Theory and Their Applications Session (Invited Session), INFORMS International Meeting, Singapore, June 1995. Chairman of the Multicriteria Optimization Session, ORSA/TIMS Joint National Meeting, Detroit, Michigan, October 1994.